Les joueurs ont passé 77790 minutes dans mes apparts. Prix : 10Crédits ! Te permet de te rendre a la salle 15 du maze run ! Uniquement a Poisson.De.Lune ! Ce pass permet de passer plus vite et c'est pour les petit budgets. Pass vip 24h seul = 6c / Prison 24h seul = 6c. Les deux pour 10c. Valable 24h. .:|:. Pousse Ton Cash .:|:. 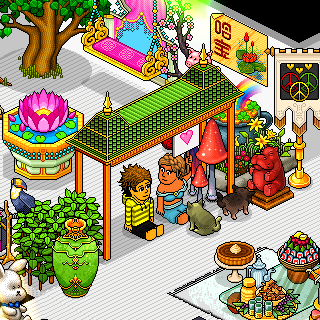 Nouveau PTC dans Habbo Hotel. Crée le : 14 Février 2019 ! Bon jeu à tous. Coût 30c. Permet de passez plus vite. Pass au mois. Non remboursable. Non echangeable. Viens jouer au jeu du frigo ! JE DONNE TOUT BY MEAY !! Danse , Cours C'est toi le meilleur ƒ! Ou pas .....hihihi! Taken in this room on 20 February 2019 and received 6 likes. Taken in this room on 21 January 2019 and received 0 likes. Taken in this room on 16 January 2019 and received 7 likes. Taken in this room on 10 January 2019 and received 3 likes. Taken in this room on 9 January 2019 and received 6 likes. Taken in this room on 24 December 2018 and received 6 likes. Taken in this room on 23 December 2018 and received 6 likes. Taken in this room on 22 December 2018 and received 1 likes. Taken in this room on 19 December 2018 and received 8 likes. Taken in this room on 18 December 2018 and received 7 likes. Taken in this room on 15 December 2018 and received 8 likes. Taken in this room on 3 November 2018 and received 2 likes. Taken in this room on 18 September 2018 and received 3 likes. Taken in this room on 11 September 2017 and received 0 likes. Taken in this room on 8 September 2017 and received 1 likes. Taken in this room on 8 September 2017 and received 0 likes.